Hopwood-based artist Paula Hamilton visits some friendly scarecrows. I’m sure I’m not alone in having read and loved the Worzel Gummidge books as a child, written by Barbara Euphan Todd. In the late 1970s and early 1980s the books were made into a series on TV starring Jon Pertwee as Worzel and Una Stubbs as Aunt Sally; this time we watched Worzel with our children with as much delight as when we read the books as children ourselves. The idea of a mischievous scarecrow who comes to life and has a wry sense of humour still seems wonderful, along with the underworld of characters who he was associated with, such as the Crowman. I recently came across a local modern day Crowman by the name of Steve Hayward, who also writes stories about scarecrows and makes portraits of them, runs workshops on making them, gives talks about them, animates them and the rest. . .
Steve’s own story with scarecrows started when he made one called “Herb” for his garden. Steve’s daughter, who was nine at the time, thought Herb was great and suggested that he needed a wife, so “Gladdy” was created. Other relatives and characters were added to the clan and it seemed a natural development that Steve should write stories about them. Eight books later, there has been the patter of tiny straw feet and the Abbott family are now five – mum, dad, their son Monk, daughter Abbey and baby daughter Scarebabybell; she’s recently taken her first steps on YouTube! Steve now has about 60 scarecrows in his menagerie. What is hard for me to convey in a written article is the great sense of fun that abounds in all that Steve does, often using his characters as a vehicle for humour. Just the names of these scarecrow characters make you smile; there’s Potpourri the vicar (not a real vicar, he just smells nice); Dr Scare is from the NHS (Nice Happy Scarecrow) and carries a key in order to perform keyhole surgery. Dr Scare lives in a massive house called Bedside Manor. Constable Hay Wayne is the village copper but, as there is no crime in the village, he has to “borrow” things, hide them and investigate their disappearance in order to create work for himself. Lovely, whimsical humour guaranteed to make you smile. So, as well as the scarecrow sculptures and stories about them, Steve also uses oil paint on canvas to paint scarecrows dancing and cavorting; he has shown his paintings all over the country. There is so much more to say about Steve Hayward, so if your appetite is whetted have a look on YouTube at “Steve Hayward the Belbroughton Scarecrows”, showing many scarecrow characters in a village celebratory festival. 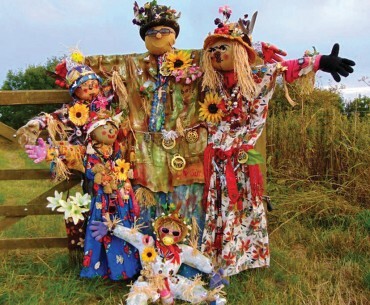 This is a good time of year to think about scarecrows as they will soon be put back in the barn for the winter, after protecting the crops during harvest time; then out they’ll come again in the spring to scare off the birds while seeds are planted. I’m definitely going to have a go at making a scarecrow for the garden next spring, inspired by this creative man, Steve Hayward. * If you’re in Birmingham in early October, you might want to pop in to the RBSA Gallery in St Paul’s Square, B3 1SA. I have a solo show on the café wall which finishes on Saturday October 10.